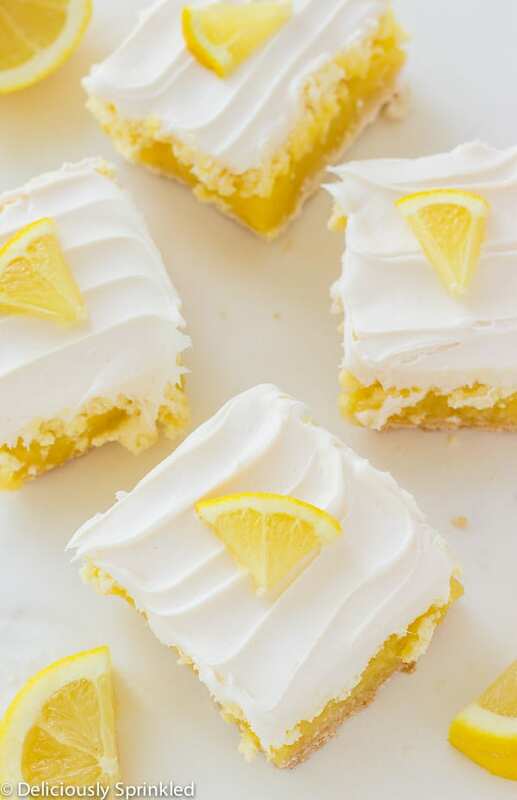 These Frosted Lemon Cheesecake Bars are the easiest and best lemon bar recipe because they’re topped with a layer of cheesecake and cream cheese frosting. 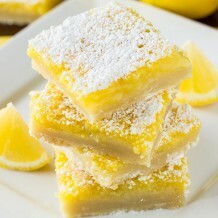 These Lemon Squares are SO GOOD! These are one of our favorite easy dessert recipes. If you’re a lover of anything lemon, these Lemon Cheesecake Bars are calling your name. Once the weather starts to get a bit warmer, I start craving the flavor and taste of lemon. Maybe it’s that it reminds me of lemonade…or that I just long for Summer to be here…but now that the temps have continuously stayed above 70 degrees these past few weeks, I need that lemon taste now more than ever. I can’t explain to you just how good this is. It’s creamy, it’s light and somehow the balance of lemon and cheesecake is absolutely perfect. I envision myself eating this during the Summer while I’m sitting out on the porch watching the sunset…It’s just one of those desserts that is a perfect finisher to every single meal. 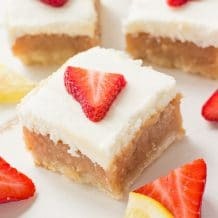 And if you love lemon, and if you love cheesecake, these Lemon Cheesecake Bars are an absolute must. 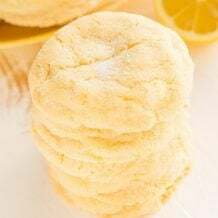 I have a very good feeling that once you make it and taste it, you’ll be on total agreeance on just how awesome this lemon recipe truly is! PRE-STEP: Preheat oven to 350F degrees. 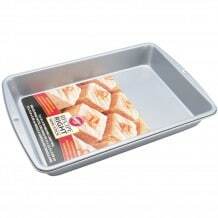 Line a 9×13 inch baking pan with foil, leaving a 2-inch overhang on two sides; coat the foil with cooking spray. Set aside. STEP 2: In a mixing bowl, mix lemon mix packets, water, and eggs until well blended. Pour lemon mixture over crust. STEP 3: In a mixing bowl, using an electric stand or hand mixer, cream together cream cheese and sugar until smooth. Mix in eggs one at a time. Add vanilla and mix in sour cream. Pour cheesecake mixture over lemon layers. 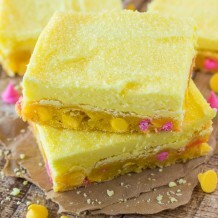 Gently spread cheesecake filling into an even layer. STEP 4: Bake for 35-40 minutes. 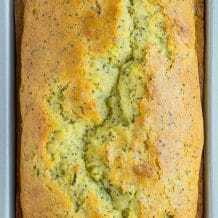 Remove from oven and allow to cool at room temperature for 45 minutes then transfer to refrigerator and chill at least 2 hours. STEP 5: Beat softened butter on medium speed with an electric or stand mixer. Beat for 3 minutes until smooth and creamy. Add cream cheese, powdered sugar, heavy cream, salt, and vanilla extract, increase to high speed and beat for 3 minutes. Spread an even layer over chilled bars. Cut into squares. Store leftovers in an airtight container in the refrigerator. 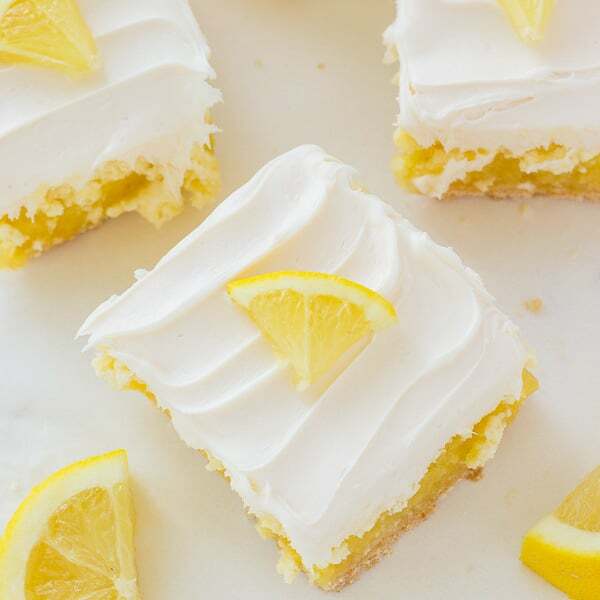 LINE YOUR BAKING PAN: To make it super easy for you to cut these lemon bars into squares, line your 13×9 inch baking pan with aluminum foil, leaving enough overhang on the sides and spray the foil with non-stick cooking spray. Once the bars have cooled lift the bars out of the pan, folding down the aluminum foil sides. CREAM CHEESE FROSTING: For the cream cheese frosting, I recommend using heavy whipping cream because it gives the frosting that thick, creamy, texture that everyone loves. But if you don’t have heavy whipping cream, you can use milk but just note that your frosting might not be as thick. 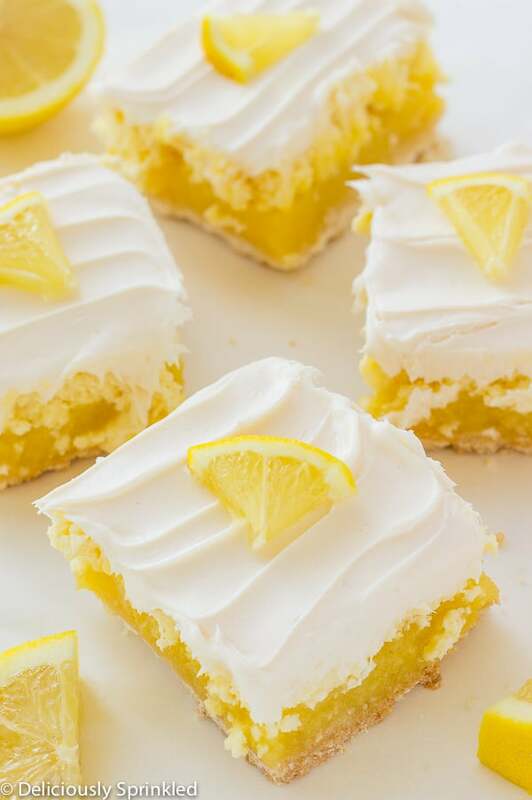 CUTTING BARS INTO SQUARES: The secret to cutting these bars into perfect squares is to use a plastic knife or a silicone spatula because they don’t have sharp edges for the lemon bars to stick to, so they cut more smoothly. 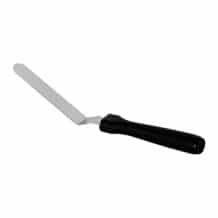 Also, make sure that the bars are COMPLETELY COOLED before cutting. PRE-STEP: Preheat oven to 350F degrees. Line 13 by 9-inch baking pan with foil, leaving a 2-inch overhang on two sides; coat the foil with cooking spray. Set aside. STEP 2: In a mixing bowl, mix lemon mix packets, water and eggs until well blended. Pour lemon mixture over crust. STEP 5: Beat softened butter on medium speed with an electric or stand mixer. Beat for 3 minutes until smooth and creamy. Add cream cheese, powdered sugar, heavy cream, salt and vanilla extract, increase to high speed and beat for 3 minutes. Spread an even layer over chilled bars. Cut into squares. Store leftovers in an airtight container in refrigerator. OH my goodness, these are absolutely amaaazing!! The perfect dessert for spring!! These are heavenly! Love the creamy cheesecake with that frosting – so good! 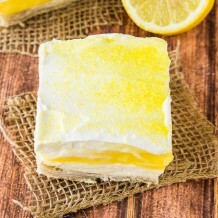 I love lemon desserts especially in the spring. These were absolutely amazing! !